This is an oral history, an ancient story recounted by generations of Hoh and Quileute people who live on Washington's Olympic Peninsula. Sagas describing great battles between Thunderbird and the whale are told from Vancouver Island to the Tillamook in Oregon. Additional stories about earthquakes and tsunamis are found among the Yurok and Wiyot, coastal peoples of northern California. These locations, coincidentally, define the region of the Cascadia Subduction Zone discussed in previous posts here. Yes, the Quileute are the native people in the Twilight series of books and movies. The stories are now known to describe a massive earthquake and tidal wave that occurred before European settlement. In the 1990's, earthquake researchers recognized their value. The story of "Thunderbird and the Whale" is now considered documentation of a Cascadia megathrust earthquake and the tsunamis that followed. The epic may specifically relate to the January 26, 1700 event when an "orphan tsunami" was concurrently documented in Japan. It is also a beautiful creation-flood story joining those told by people around the world. The history of the Pacific Northwest did not begin with the arrival of Europeans. We know there were people living here some 15,000 years before European settlement. They were people of wealth and technology and accomplished artisans. They were whalers and seafarers on a par with the Vikings and they lived in settled communities. A rich tradition of storytelling has been their gift to us. This gift not only reveals our local history, but may predict our future as well. This illustration depicts a late-19th century interior ceremonial screen from Port Alberni, on British Columbia's Vancouver Island. It shows Thunderbird carrying Whale in its talons, a common native depiction of seismic activity. The original screen is in the American Museum of Natural History. 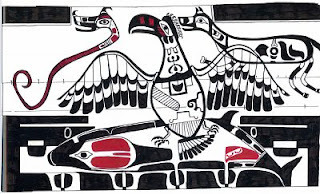 The image is taken from Northwest Coast Indian Painting: House Fronts and Interior Screens, by Edward Malin, © Copyright 1999, Timber Press, Portland, OR. The image and attribution source is UW News, but it is also seen elsewhere. A good faith effort to acquire explicit permission to post the image here is ongoing. In this attempt, I have been passed around from party to party. So far, no one is accepting responsibility. If and when anyone with standing objects, I will remove it. I make no claim of ownership whatsoever. Thank you for this tale. I think lot of old legends refer to natural disasters and occurances - it's the easiest way for an oral tradition to remember them. It is quite appropriate in light of recent terrible news. A reminder it has happened before and of course will happen again. Carrie, Sandy, appreciate the comments. Thanks very much.